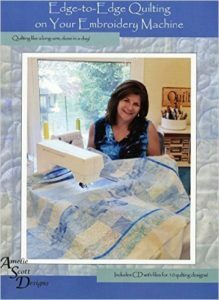 If you have a machine that embroiders this class is for you! You’ll be amazed at the edge to edge quilting that you can do in the hoop. Amelie Scott is up to 6 expansion packs of designs so you’ll be able to “Quilt Like a Long Arm but Done in a Day!” Class fee includes 2 yards of solid fabric which will become the tote bag. Edge to Edge Quilting Design pack and USB stick are required.